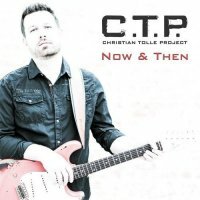 This, the fourth album of the guitarist, producer and song-writer Christian Tolle, is a good Rocking album featuring some big names, like Doug Aldrich on guitar with no less than six vocalists, and is definitely worth a listen. Opening track 'Dumped' is a fast-paced Rocker, redolent of the band Europe, but in fact featuring German vocalist Michael Voss and it's a pretty good start to the album. The oddly named 'Magic Pudding', another richly polished Rocker, is about a night-time encounter with a young lady and the rich vocals again could pass for Joey Tempest, except the sleeve notes tell us that it is John Cuijpers (Praying Mantis). Cuijpers appears later on the album with another Metal-inspired performance on 'Enemy'. John Parr, he of eighties fame, appears on the lighter track 'The Real Thing' which is easy on the ear and highly commercial. He sings another track with a slightly Bluesy feel later on in the album about sending a woman 'Back To The Moon' when things are over. The majority of the rest of the album is Pop Rock with 'On And On', featuring an infectious chorus and the pipes of Rick Riso, being the best of that selection. '87 99' is the exception to that statement, what with it being an instrumental guitar piece. The primary figure on this album is, of course, the guitarist himself and it's experimental, a little Jazzy and a little Bluesy to my ears. Not wedded to the Metal genre and pleasing itself, this is Tolle just having fun. Whilst this album is mostly easy listening, I enjoyed the fewer Hard Rock tracks best, however it's clear that Tolle's interests do not lie exclusively in that field so this album is probably best suited to people with diverse tastes or those cherry picking/purchasing individual tracks online.